Make yourself at home in one of the 1224 air-conditioned rooms featuring minibars and LED televisions. Complimentary wireless Internet access keeps you connected, and cable programming is available for your entertainment. Private bathrooms with shower/tub combinations feature complimentary toiletries and hair dryers. Conveniences include phones, as well as safes and desks. Featured amenities include complimentary wired Internet access, a business center, and limo/town car service. Planning an event in Cotai? This hotel has 6760 square feet (628 square meters) of space consisting of conference space and a meeting room. Guests may use a ferry terminal shuttle for a surcharge, and self parking (subject to charges) is available onsite. With a stay at JW Marriott Hotel Macau in Cotai, you'll be a 3-minute drive from Cotai Strip and 5 minutes from Venetian Macao Casino. This 5-star hotel is 2.5 mi (4 km) from City of Dreams and 3.8 mi (6.2 km) from Macau Tower. Grab a bite at Saffron, one of the hotel's 3 restaurants, or stay in and take advantage of the 24-hour room service. Quench your thirst with your favorite drink at the poolside bar. Buffet breakfasts are available daily from 6:30 AM to 10:30 AM for a fee. Enjoy Chinese cuisine at Lai Heen, one of the hotel's 3 restaurants, or stay in and take advantage of the 24-hour room service. Snacks are also available at the coffee shop/café. Relax with your favorite drink at the bar/lounge or the poolside bar. Buffet breakfasts are available daily from 6 AM to 10 AM for a fee. Make yourself at home in one of the 56 air-conditioned rooms featuring LCD televisions. Complimentary wireless Internet access keeps you connected, and cable programming is available for your entertainment. Private bathrooms with showers feature complimentary toiletries and hair dryers. Conveniences include phones, as well as desks and electric kettles. 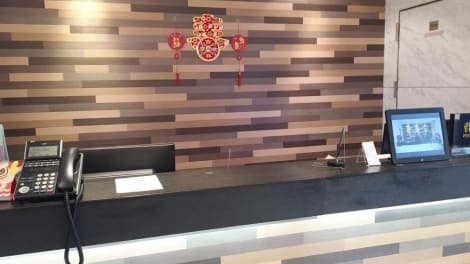 When you stay at Golden Crown China Hotel in Taipa, you'll be connected to the convention center, within a 10-minute drive of Venetian Macao Casino and City of Dreams. This hotel is 5 mi (8.1 km) from Macau Tower and 2.8 mi (4.5 km) from Cotai Strip. Make yourself at home in one of the 1598 air-conditioned rooms featuring iPod docking stations and flat-screen televisions. Complimentary wired and wireless Internet access keeps you connected, and digital programming provides entertainment. Bathrooms have rainfall showerheads and complimentary toiletries. Conveniences include safes and desks, as well as phones with free local calls. Once a colony of the Portuguese Empire, Macau is now a Special Administrative Region of the People's Republic of China and one of the wealthiest cities in the world. It is home to many impressive colonial landmarks, numerous world-class casinos, and an incredibly diverse restaurant scene. One of the most memorable sights in the city is undoubtedly the Senado Square, which is one of the city's largest public spaces and is part of the Historic Centre of Macau UNESCO World Heritage Site. The square, which is close to dozens of elegant Macau hotels, features the enchanting Holy House of Mercy, which dates back to the 16th century and was once an orphanage. This extraordinary landmark, which was completed in 1640, is a defining landmark of the city and comprises a striking facade that is the remnants of the former church. Often nicknamed Macao's very own 'Acropolis', the Ruins of St Paul contained the oldest Western university to be founded in East Asia, and are known for their unique Baroque features. If you're looking for the best view of the city, head to the top of the Macau Tower, which is 338m high and provides outstanding panoramic views of the entire city. The tower was completed in 2001 and contains world-class shops, restaurants and entertainment venues, although the site is also popular with ambitious bungee jumpers. See the beautifully preserved Igreja da Sé cathedral, which was originally built in the 17th century but was redesigned in the 20th century. Another remarkable church is St. Joseph's Seminary and Church, which dates back to the early 18th century and, like Igreja da Sé, is part of the city's World Heritage Site. If you have time, you should also explore the splendid A-Ma Temple, which is more than 500 years and is a classic example of Taoist architecture. If you're a big fan of classic Italian cuisine, head to the Portofino restaurant, or dine at the Vida Rica at Mandarin Oriental for other superb international dishes. The Belcancao restaurant, meanwhile, serves mouthwatering Portuguese, Chinese and international food, while the Golden Peacock is the place to be if you're looking for some vibrant Indian flavours. One of the most exclusive hotels in the city is the Banyan Tree Macau, which offers outstanding hospitality and luxury five-star accommodation. Other reputed hotels include the Mandarin Oriental Macau and the Galaxy Hotel, while the stylish Grand Coloane Resort Macau and the Sheraton Macao Hotel Cotai Central provide excellent value for money. However, don't forget that there are many other fantastic accommodation establishments in Macau that can cater to all tastes and budgets.